Quite recently I made two maps for a Swedish RPG called Fantasy! It is an old school game that goes back to the roots of the RPG hobby. This means maps in black and white. I found it very enjoyable to make those maps. It is something special to just use black and white while making maps. You just have those two colours nothing else. No grey areas just those two opposite colours, it is a bit like working with negative and positive spaces and try to make it look as good as possible. After finishing the maps, which I had to do in a very short space of time due to a deadline coming up, and I came in rather late in the project, I felt that I wanted to push this style a bit further. I felt that I could make much more of it, that there were a lot more boundaries to explore here. The map in this post is a very early version of the more developed style I’m now working on. It is of a dragon that has moved in to the entrance of a Dwarven underground kingdom. A perfect place for a short evening scenario where the players have to rid the entrance of the dragon, so that the Dwarves can start using it again. For the style I’ve also decided that I will make some more monsters, not just having a dragon. This is a way for me to try to develop my drawing skills as I’m not very used of doing monsters or creatures. I used to do a lot of drawing while in school so many years ago. But since then I’ve nearly only done map art, like mountains and trees. So you can say I’m a bit rusty. I thought it was time to try to push my skills a bit forward and challenge myself with something else then mountains. So at the moment I’m trying to make a list of creatures that might come in handy, except dragons, while making old school maps. I’m trying to focus on larger monsters here not the ordinary orc soldier. 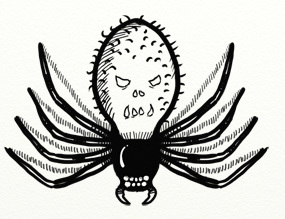 The picture below is of a great spider, spiders are always fun to throw at your players. 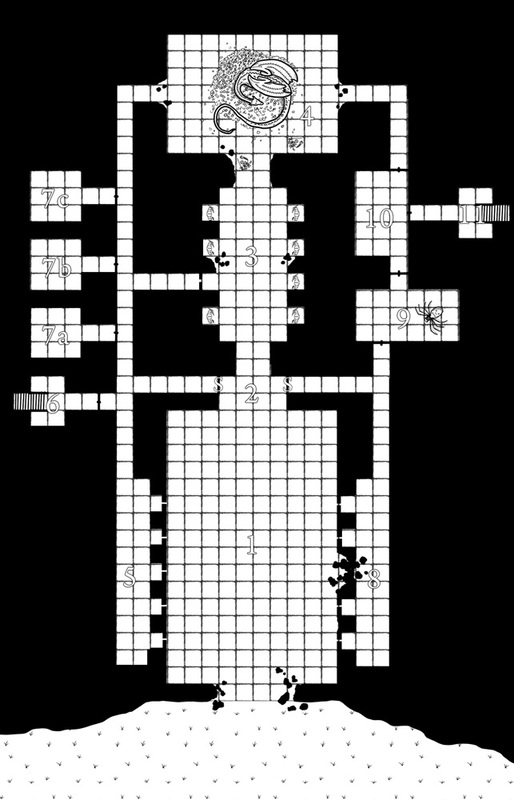 Any suggestions of other large monsters or creatures that like to reside in dark dungeons or catacombs? I was really looking forward to this month’s annual (April, 2013) by Jonathan Roberts. His earlier ones are two of my absolute favorites. I must say though that at first I was a bit disappointed when I looked at this month’s style. 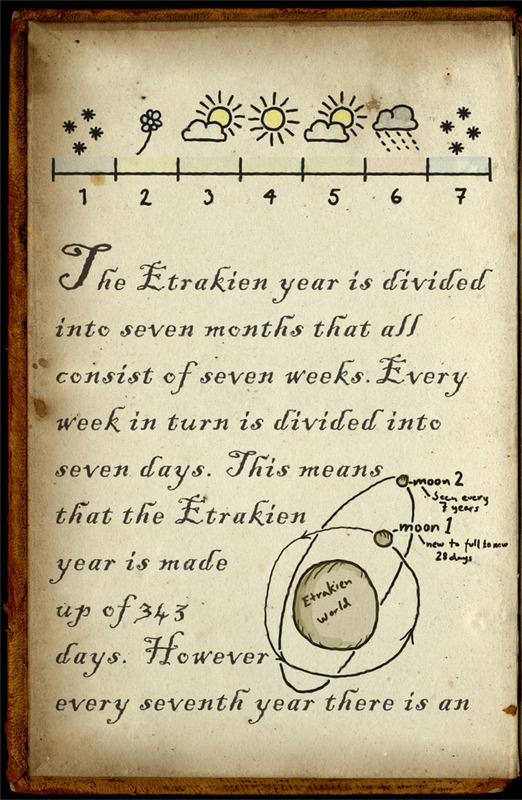 If you look at the earlier overland map annual he made the symbols are in my opinion some of the best ones I’ve seen so far published by Profantasy. Every mountain, city and hill icon are like small pieces of art, and the new symbols in this month’s annual doesn’t really reach the same standard. Still they are looking great and a there are a lot of useful symbols that I missed in the first overland style from Jonathan, like the cliff edges. The thing here is that Jonathan has spoiled us with such great maps and products that the expectations you have on a new style from him are probably impossible to live up to. Already before I received this month’s style I had decided on making a map in the style to try it out. Some time ago I was asked if I could make a colour map of the campaign world from a Swedish old school RPG called Fantasy! (great game by the way), so I thought it would be a great way trying out the new style. In the end I however used more symbols from the old overland style then the new one, but some crucial pieces in the map are from the new one. As always it is easy to quickly build up a map in CC3, as long as you do it in the right order. 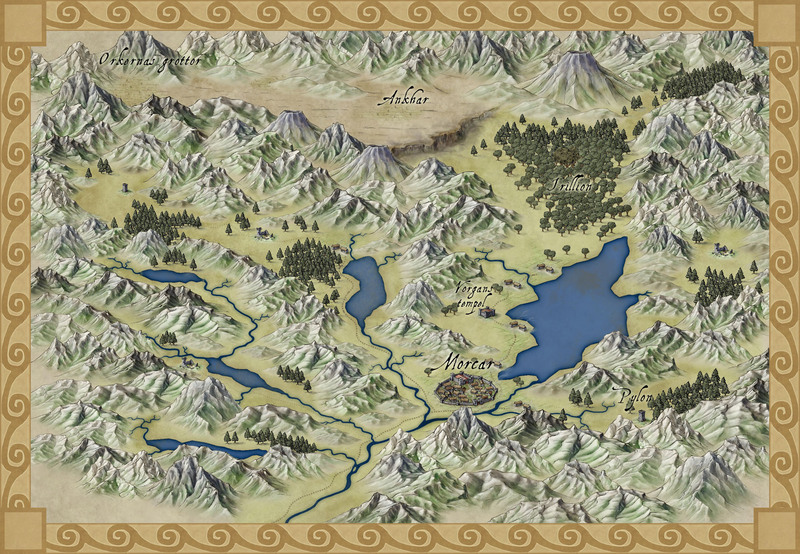 I think that one of the great advantages of CC3 is that it lets me make maps in styles I normally can’t. For me to make a map in the same style as Jonathan Roberts without CC3 would take ages, if it would be possible at all. Now I can accomplish it in about a day’s work, which is absolutely amazing. As always when I work in CC3 I like to bring up the map in Photoshop to make it more unique and give it a bit of a personal touch. This time I’ve added some colours, especially around the area called Ankhar on the map, and I also painted the rivers in Photoshop. I wanted the rivers to be more irregular in form then what you can get in CC3. I’m very pleased with the result and now with more symbols to use with the new style from Jonathan I definitely think I will return to this style in a not too distant future.